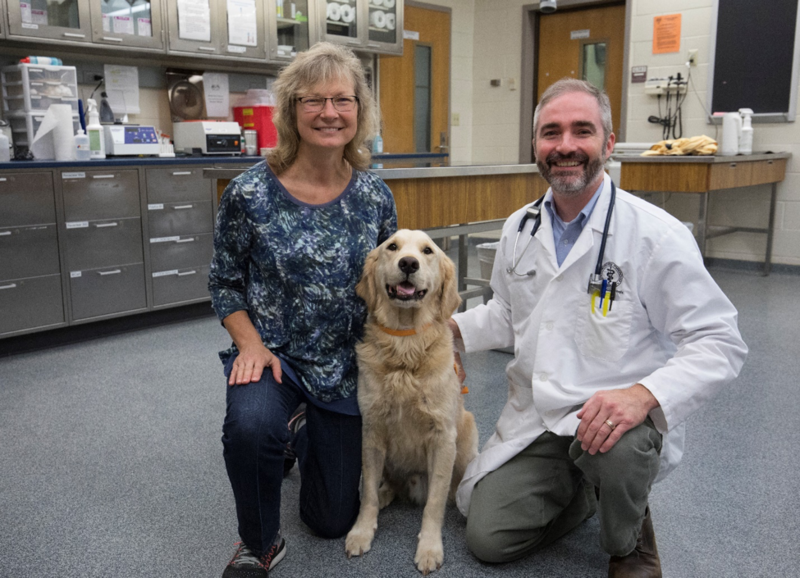 Purdue Veterinary Medicine Research holds promise for improving treatment of lymphoma in dogs and humans. Dr. Michael Childress (right) with his patient Kody, a handsome 8yr old golden retriever, and Kody’s owner, Mrs. Carolyn McGuire (left). Kody was diagnosed with diffuse large B-cell lymphoma in July 2016 and was a participant in Dr. Childress’s latest study. Now fourteen months later, Kody is alive with successful remission of his cancer. His excellent response to chemotherapy was predicted by biodynamic imaging. Lymphomas are cancers that most commonly occur in organs that function as part of the immune system such as lymph nodes, spleen, and bone marrow. Non-Hodgkin lymphoma (NHL), which consists of all lymphomas except Hodgkin Lymphoma, ranks 6th among the causes of cancer mortality in people in the U.S.
Dr. Michael Childress, associate professor of comparative oncology in Purdue Veterinary Medicine’s Department of Veterinary Clinical Sciences, was instrumental in carrying out a recent clinical trial that employed biodynamic imaging technology to identify new biomarkers that can help tailor the best treatment regimen for individual canine cancer patients – particularly those with non-Hodgkin lymphomas. Biodynamic imaging (BDI) is a technology developed by Purdue scholars Dr. John Turek, Purdue Veterinary Medicine professor of Basic Medical Sciences and Dr. David Nolte, Edward Purcell distinguished professor of Physics. Animated Dynamics, Inc., an Indianapolis-based start-up company founded by Drs. Turek and Nolte, currently licenses this technology from Purdue University for commercial development. Biodynamic imaging uses low-coherence light rays to illuminate a living, three-dimensional tissue and translates the scattered light from the tissue into a 3D hologram. Utilizing mathematical equations, different component frequencies (0 to 12.5 Hz) that were used to create the hologram can be analyzed and then individually related to the movements of different intracellular organelles. In clinical practice, these movements are mapped within living tumor cells derived from tissue biopsies from cancer patients. When chemotherapy drugs are applied to these tumor tissues, the tissue reacts by altering various aspects of intracellular motion. 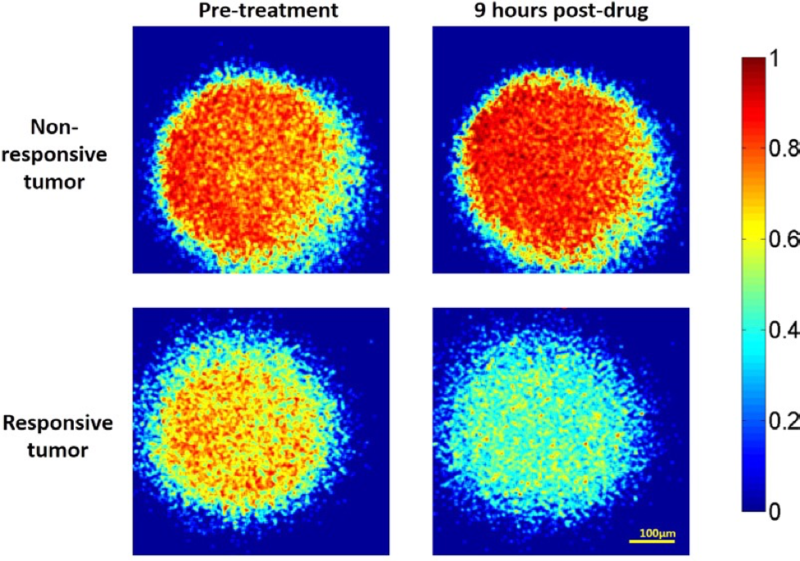 The pattern in which intracellular motion is altered by chemotherapy is recorded by BDI, generating a motion-based signature predicting whether an individual patient’s cancer will respond favorably to a given drug. While genotypic or genetic analysis of tumors currently is used to personalize chemotherapy, that approach is not always useful. In contrast, BDI creates a phenotypic profile, revealing the net effect of the genotype in combination with the environmental effects within and surrounding the tumor. Biomarkers developed using BDI provide the phenotypic profile of cancers in response to anti-cancer drugs, making it possible to predict the best combination of drugs to shrink the tumors. With the incidence of lymphoma on the rise, Dr. Childress seeks to improve treatment outcomes for both dogs and humans. Canine lymphomas and non-Hodgkin lymphoma in humans are very similar, and both tumor types are treated with similar chemotherapy. Furthermore, since non-Hodgkin lymphomas in dogs are biologically diverse requiring personalized therapy, they represent highly suitable models for studying the prognostic and predictive value of the biomarkers developed with BDI. Therefore, this research on canine lymphomas is likely readily applicable to human NHLs. Doxorubicin-based combination chemotherapy is a common form of cancer treatment in dogs with NHL. A study published in Convergent Science Physical Oncology by Dr. Childress and his Purdue collaborators sought to determine whether BDI performed on tumor biopsies from 10 dogs with NHL could predict the drug response of cancers in these dogs, improving the success of cancer chemotherapy. Six biomarkers identified in this study predicted, with high accuracy, the response of tumors in dogs to the drug doxorubicin. Tests showed that these biomarkers identified which dogs’ cancers would respond, and which would not respond to the doxorubicin. The dogs whose tumor biopsies displayed responsiveness to doxorubicin in the BDI assay showed better overall response to chemotherapy and had longer disease free survival times. An example of how BDI identifies tumors that will or will not respond to chemotherapy is shown in the figure on the left. The color scale on the right of the graphic shows different levels of aggregate intracellular motion of tumor cells. The greatest and lowest intracellular motion is shown with red and blue colors respectively. The response of sensitive and resistant tumor cells to the cancer drug doxorubicin can be clearly visualized in these 1mm3 sections of live tumor cells obtained from tumor biopsies. In the non-responsive or resistant tumor, the aggregate motility of the cells either did not change or slightly increased (see figure) after treatment with doxorubicin whereas, in the responsive tumor, aggregate motility was shown to decrease after the same treatment. In a recently completed follow-up study, BDI was used to predict the response of dogs with diffuse large B-cell lymphoma (DLBCL) to CHOP chemotherapy, a combination of four chemotherapy drugs: cyclophosphamide, doxorubicin, vincristine, and prednisone. Dr. Childress and his colleagues found that BDI predicts the response of canine DLBCL to CHOP with 95% accuracy. “We know that standard chemotherapy extends the life of most dogs with diffuse large B-cell lymphoma, but a few dogs are not so lucky,” Dr. Childress says. “Until now, we had no good way to tell at the outset of therapy who those unlucky few dogs would be. Biodynamic imaging now allows us to identify these dogs with great accuracy. Knowing which dogs with lymphoma are least likely to benefit from existing therapies is important, as it helps us to identify the subset of dogs most in need of new treatments, and allows us to focus on these dogs as newer, more effective therapies become available.” Further research at Purdue University is studying the application of biomarkers identified from dog lymphoma research to human NHL.